Wonderful design that will delight the lucky recipient. Presented in a lovely coordinating gift box. Size is a nice large white wine glass. Perfect for the wine lover and those that also enjoy nature and animals. 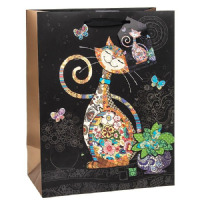 Matching gift bags and other matching items available to enhance the gift experience - to see them, click Bug Art Collection Gifts & Wrap above. Encased inside gift box in a taught plastic top and bottom container holding the glass firmly in place preventing damage.